The Deep Space Station 63 (DSS-63) is the largest of seven radio telescopes at the Madrid Deep Space Communications Complex. Miguel Claro is a professional photographer, author and science communicator based in Lisbon, Portugal, who creates spectacular images of the night sky. As a European Southern Observatory photo ambassador, a member of The World At Night and the official astrophotographer of the Dark Sky Alqueva Reserve, he specializes in astronomical "skyscapes" that connect the Earth and the night sky. Join Miguel here as he takes us through his photograph "The Path of Light from a Super Blue Moon." Sirius, the brightest star in the night sky, glows brilliantly near the tip of a telescope's antenna in this photo taken at the Madrid Deep Space Communications Complex (MDSCC) in Robledo de Chavela, Spain. The MDSCC is part of NASA's Deep Space Network (DSN), global network that makes it possible for spacecraft out in the solar system to communicate with Earth. 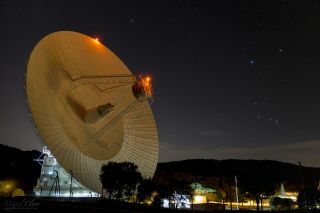 Two additional facilities make up the DSN, one in Canberra, Australia, and another in Goldstone, California. These centers are located approximately 120 degrees apart on the globe to allow spacecraft to maintain contact with at least one ground station, regardless of the daily movement of the Earth's rotation. The 230-foot (70 meters) antenna of DSS-63 appears to point toward Sirius, the brightest star in the night sky. Above it and to the right shines the colorful winter constellation of Orion. Each DSN site has one of these huge, 230-foot antennas. These are the largest and most sensitive telescopes across the network, and they are capable of tracking spacecraft traveling billions of miles from Earth, like NASA's New Horizons mission to Pluto. NASA created the DSN in 1958 to prepare for ambitious lunar and planetary missions. As spacecraft began venturing beyond Earth orbit, NASA needed more-powerful communications tools to track the probes. The antennas were designed to receive faint signals from deep space and transmit very strong ones out to distant spacecraft. DSS-63 was upgraded from 210 feet (64 m) to 230 feet in 1987 to enable the antenna to track NASA's Voyager 2 spacecraft as it encountered Neptune. The stations communicate with the space vehicles via radio waves, which can carry messages in both directions. The radio waves belong to the part of the microwave spectrum with frequencies ranging between 30 and 100,000 MHz, and the signals propagate at the speed of light, or 186,282 miles per second (299,792 kilometers per second). Transmissions received can contain images, telemetry and data from scientific instruments. These messages use a binary language, or sequences of 1s and 0s turned into electrical impulses that are carried by radio waves. Some of the future missions that this gigantic antenna will support include the James Webb Space Telescope, the Parker Solar Probe, the InSight Mars lander and a cubesat mission called Interplanetary NanoSpacecraft Pathfinder In Relevant Environment (INSPIRE). A long-exposure shot shows star trails above DSS-63 at the Madrid Deep Space Communications Complex. Enter the intricate world of NASA's Deep Space Network as it provides you an inside look in real time at how the team communicates and tracks multiple spacecraft within the solar system 24 hours a day, seven days a week and 365 days a year.